Rake : SARL Maxima, Specialists in the sale and reparation of machines and accessories for the construction industry. Importer and distributor of both hydraulic and pneumatic equipment. MAXIMA offers its LAND RAKES. Ideal of landscaping and land reclamation, the rake can be used to remove oversize material from fields and gardens and is particularly useful in the preparation of lawns. We manufacture according to your needs: the length (within the limits of your machine) and the spacing between each tooth. The distance depends on the type of material that you want to remover from the soil; rocks, branches, etc. The most common distance is 75mm, and the minimum spacing is 50mm depending on the size of your machine. We have approximately 500 designs of rakes so we are sure to have something to suit your needs. 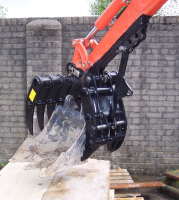 Accompanied with a bucket or grapple, the rake is very useful for moving branches or waste.